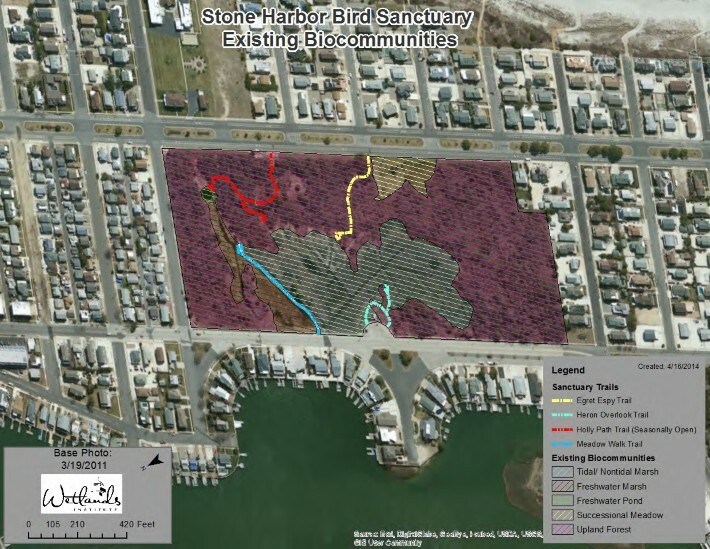 This vegetation management plan will outline an invasive species control strategy for the Stone Harbor Bird Sanctuary in Stone Harbor, New Jersey. The goal of this plan is to restore native vegetation and wildlife habitat in the Sanctuary to enhance opportunities for colonial wading bird nesting and utilization of the site by migratory and resident songbirds and other wildlife. The Sanctuary includes a diverse array of habitats ranging from tidal and non-tidal salt marsh, to freshwater marshes and a freshwater pond, to a warm season grass and shrub scrub successional meadow and upland forest (Map 1). Four nature trails run through the Sanctuary providing education and wildlife viewing access (Map 2). A number of non-native invasive plants and aggressive native vines have become established within the Sanctuary, crowding out native vegetation, reducing diversity and degrading habitat for wildlife. In order to restore the native vegetation and wildlife habitat of the Stone Harbor Bird Sanctuary, many of the invasive plants and aggressive vines should be controlled. Both physical and chemical control treatments may be used to control invasive plants; however, where physical removal is preferred it will need to occur several times during the growing season to suppress invasive plant growth and the process will need to be repeated over several successive growing seasons. Following the removal of target non-native invasive plants and aggressive native vines, native herbaceous and woody plants may be planted to create better habitat for wildlife, including berry and nectar producing plants. The addition of a variety of plant species native to this area will not only attract and sustain more wildlife, but will also increase overall biodiversity in the Sanctuary. The following list includes target non-native invasive plant species to receive control treatments. Additional invasive plants may be present and should undergo control treatments and management as Borough and The Wetlands Institute staff deem necessary. The most prolific invasion of the Sanctuary is invasive non-native or aggressive native vines that are covering the native tree canopy and dominating the forest understory. 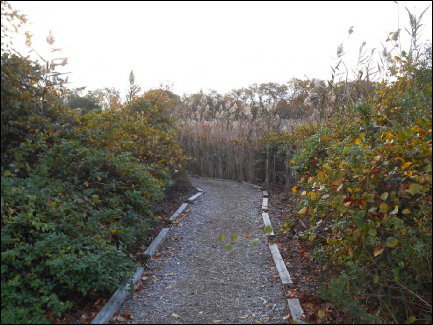 Japanese Knotweed (Polygonum cuspidatum, Fallopia japonica) has dominated some areas of the Sanctuary but has been successfully managed through a vegetation management program initiated by the US Fish and Wildlife Service working in partnership with the Borough of Stone Harbor. However, vigilance and continual inspection is required to immediately mange new occurrences. Isolated instances of Privet (Ligustrum sp. ), Autumn Olive (Elaeagnus umbellata) and Multiflora Rose (Rosa multiflora) have been noted and should be managed on a case by case basis. The inclusion of native aggressive vines in the management plan is important because they are impacting native trees, closing the canopy, and reducing biodiversity at the site. Overgrowth of these aggressive vines is so severe in some areas that tress are stunted, dying, and/or subjected to enhanced breakage during wind storms. They also may be impacting habitat usage by colonial waterbirds. The levels of invasive plant presence are mapped and invasive plant control methods are proposed below. 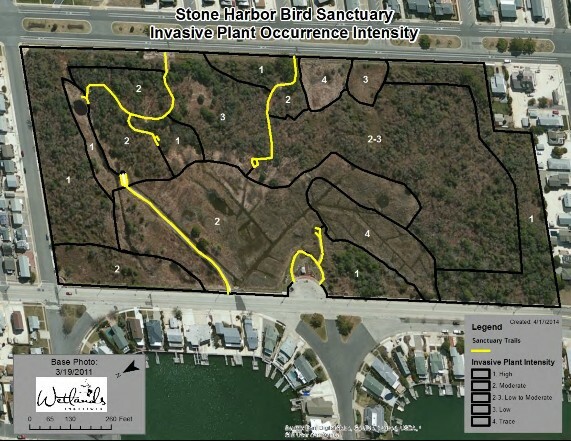 The effective management of unwanted vegetation in the Stone Harbor Bird Sanctuary will be a multi-year project that will gradually shift from control to management, to maintenance. A full year of control treatments and observation at a minimum are required before planting additional native vegetation. This component of the plan will be based on an adaptive management approach whereby observation and monitoring will be important to appropriate management. By suppressing invasive plants for a full year, native vegetation – whose roots systems and seeds may still be present – will have an opportunity to grow. Understanding which native plants may still be present in a given area will be helpful when deciding on new vegetation to use for future plantings. The proposed control treatments and areas can be altered to fit the needs of the Stone Harbor Bird Sanctuary. Volunteers may be recruited and trained to hand cut and remove several of the invasive plants present. To better prioritize areas in the greatest need of invasive plant control treatments, the Sanctuary property has been divided into management areas based on urgency and importance of management. The prioritization of work areas to manage invasive plants in the Sanctuary will be based on a decision matrix that accounts for a) the degree of invasion, b) current or historic use by priority species, c) the ease of access to an area, d) the ability to manage and maintain the area in a natural state, and e) the present condition of the area which will continue to evolve based on response to management. 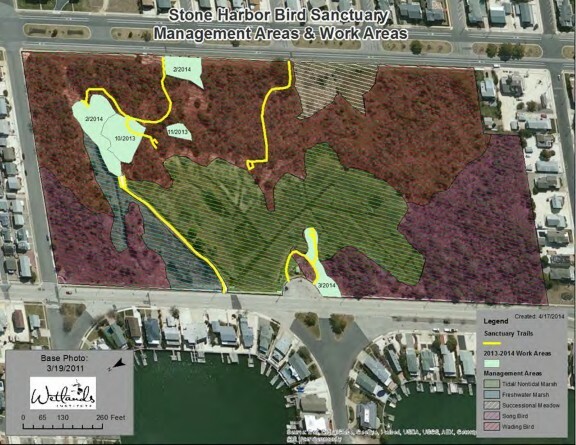 This plan outlines a strategy that can be implemented to manage vegetation at the Stone Harbor Bird Sanctuary but does not set a timeline for plan completion. The Stone Harbor Sanctuary Committee developed a mission statement for the Stone Harbor Bird Sanctuary. This mission statement appears in the Stone Harbor Bird Sanctuary (SHBS) Rejuvenation Project Preliminary Master Plan (Duffield Associates, 2006) and serves as a useful guide for the development of a vegetation management plan. To preserve, protect and foster the ecological wellbeing, and diversity of Stone Harbor Bird Sanctuary and that of the birds that nest there. To create and continually maintain an environment in the SHBS that will encourage the nesting of colonial wading and other compatible species of birds. To provide for the education of visitors to the SHBS concerning the significance of the SHBS, its historical origin and community relationship, the species of birds in the SHBS and their importance to our environment and the need for preservation of both SHBS and its inhabitants. The document further articulates a philosophy for the sanctuary, its renovation and future uses. The committee clearly articulates a desire to “implement a plan that includes long term maintenance of the SHBS to assure its ongoing success” (Duffield, 2006). The SHBS underwent a restoration plan that included improving tidal flow into and throughout the Sanctuary to restore tidal wetlands, creation of a berm to separate freshwater wetlands and improve their function, management of wetland invasive plant species, and the creation of four trails to provide recreational access. An important component of the overall management of the SHBS relates to vegetation management, including the control of invasive non-native species as well as aggressive native species in upland forested areas, especially when they impact habitat structure and suitability for bird usage. Map 1: Existing Biocommunities at the Stone Harbor Bird Sanctuary. Sanctuary trail are located. whose introduction causes or is likely to cause economic, environmental harm, or harm to human health. Invasive species can be plants, animals, fungus, pathogens or algae. Human actions are the primary means of invasive species introductions, and may be through intentional introductions (e.g. landscape and pet trade) and accidental introduction (e.g. packing crates and bilge water) (www.njisst.org/invasive-species.asp). Once present, birds and other wildlife also spread invasive plants. 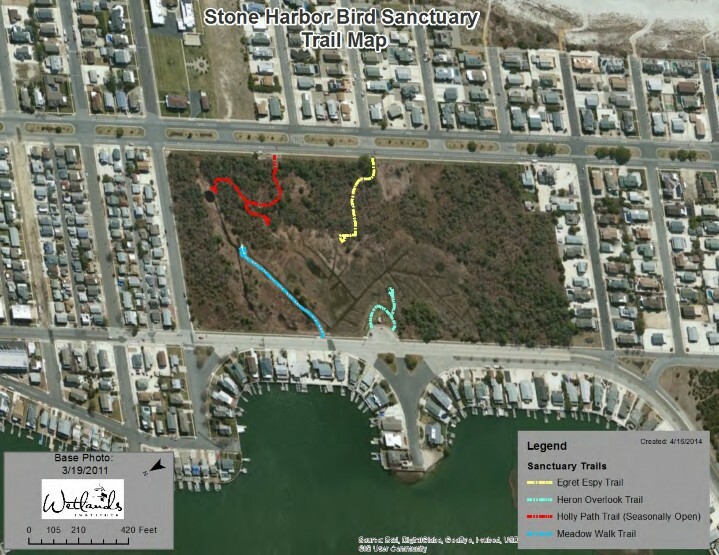 Map 2: Trails in the Stone Harbor Bird Sanctuary. Holly Path is opened seasonally with restricted access during colonial bird nesting season. Meadow Walk Trail has restricted access along the trail terminus during colonial bird nesting season. Both restrictions are to reduce disturbance for birds. For the Stone Harbor Bird Sanctuary, the focus of this management plan will be on invasive plants and the impacts that they may have on overall Sanctuary biodiversity, habitat health and stability, and habitat suitability for migratory songbirds and nesting colonial wading birds. The SHBS also serves as an important natural area in an otherwise heavily developed barrier island community. As such, it is an important refugia for certain animals and plants that will benefit from management of invasive species. common transport mechanisms of invasive plants and their establishment, and encouraging people to stop purchasing invasive landscape plants. Early Detection/Rapid Response: The focus of this control measure is on identifying invasions as they are emerging in order to prevent them from impacting native species and while their impact is still limited. The goal is to fully eradicate identified target species. Control and Management: This control method is employed where invasive species have become established. The focus is on the protection of sites with high conservation value and utilizes long-term control programs to reverse larger infestations of widespread species. The goal is restoration of the site. An effective vegetation management strategy for the Stone Harbor Bird Sanctuary should employ all three strategies. Large portions of the sanctuary already suffer significant infestations that have impacted habitat and overall site biodiversity. In other areas, new invasions have been identified and early detection and rapid response will be an ongoing and important management tool to limit intensification. The mission statement for the SHBS includes education as a recognized goal. The addition of education related to invasive species, their management, and prevention will be necessary to create and environment for sustainable management of the Sanctuary for the future. Marsh Elder (Iva frutescens) – ditch banks. Sea Lavender (Limonium carolininium) – scattered. Area 3 included two smaller areas. Area 3a included an area dominated by Black Cherry and American Holly with a paucity of invasive vines. Area 3b identifies the freshwater pond that would later become Paul’s Pond. These areas predate the restoration plan and some areas have been modified through tidal and/or freshwater flow augmentation, vegetation management, and plantings. Other areas, especially areas 1 and 3 remain largely as described. The descriptions are provided as a baseline characterization to the SHBS. The SHBS Master Plan also identifies both restoration areas and management areas. Area 2 is designated for marsh restoration and is the area that is most modified by tidal flow augmentation and water management. A berm structure also enhances the freshwater marsh in a portion of area 2. The Meadow Walk Trail now follows the top of the berm structure. Significant portions of area 3 are designated as songbird management areas. The wetland fringe bordering area 3 was designated a wading bird management area (Map 3) though specific distinctions between the songbird management and wading bird management areas are difficult to discern from the 2006 report. These designations are useful for consideration as it relates to the development of vegetation management plans. Both types of bird management areas require vegetation management to maintain habitat suitability. Habitat suitability requirements are species or guild specific, but a few primary components are critical to determining suitability. Primary habitat characteristics include such factors as food availability, presence of suitable canopy and understory characteristics to promote safe roosting and nesting, predator security, and disturbance frequency. The dominant strategy for invasive and aggressive vine management in the Sanctuary involves cutting vines and in some cases, removal and clearing of underbrush. The target habitat should be comprised of mature trees with native shrub and ground cover extending to a height of 3-8 feet above the ground. In areas designated for songbird habitat, the ground cover and understory can extend higher and a moderate presence of native vines is desirable as a food resource. These four biocommunities provide a basis for the designation of management areas within the Sanctuary and then include consideration of habitat suitability for bird usage. See Map 4. The Tidal/Nontidal Marsh Management area should be monitored and managed to maintain appropriate tidal exchange with the adjacent estuary. This should be managed by the Borough of Stone Harbor and will involve coordination with the Cape May County Mosquito Commission for maintenance of ditches and channels, and management of the flow structures by the Borough Department of Public Works. Vegetation management will include management for the Common Reed (Phragmites). It should be noted that it is unlikely that Phragmites will ever be completely eradicated from the Sanctuary. Goals for Phragmites management should focus on containment in its present areas and in some cases reduction. The most effective control mechanisms in the Tidal/Nontidal marsh areas are flooding or root saturation with salt water. This can be managed through targeted flow management of the water control structures. The distribution of Phragmites should be monitored to determine if the distribution is changing and if chemical control becomes warranted. The Freshwater Marsh Management area should be monitored for the presence and maintenance of suitable hydrology to maintain the freshwater marsh ecosystem. If the hydrology of the freshwater system deteriorates, an evaluation of suitable remedies can be evaluated at a future date. Vegetation management in the freshwater marsh area involves primarily management of Phragmites however, other invasive plants favor moist conditions and their appearance in the freshwater marsh or marsh fringe should be immediately managed. 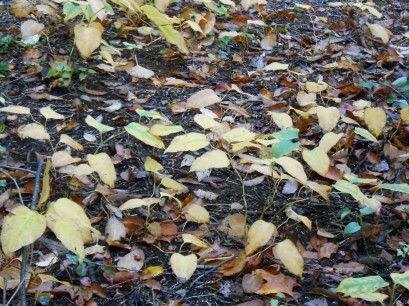 Japanese knotweed has been present in the freshwater marsh and has been successfully eradicated through chemical control methods administered by the US Fish and Wildlife Service. The freshwater marsh area has also been subjected to chemical control and management of Phragmites. This control has helped to keep the Phragmites cover limited and the density of cover thin. This management strategy should be continued along with routine inspection for new invasions and recurring outbreaks of Japanese knotweed. expansion. At some point, this area will continue to succeed back to a forested habitat. It is worth considering if the area should be maintained to hold it in an early successional phase to maintain this habitat type in the Sanctuary. This management would involve selective removal of saplings to maintain the meadow characteristic. 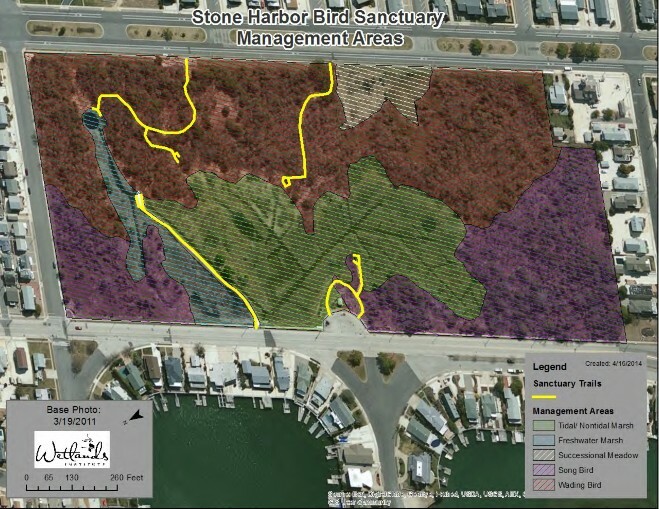 Map 4: Stone Harbor Bird Sanctuary Management Areas. Sanctuary Trails for locational reference. Songbird Management Areas are located in the upland forest areas that are largely located along the western boundary of the Sanctuary. The songbird management areas will overlap significantly with the wading bird management areas with the primary differentiation being proximity to the marsh boundary for the wading bird areas. Both areas are forested areas and suffer invasion to varying degrees by the target non-native invasive and aggressive native vines. Management and control will be similar for both areas with the primary difference being in the degree to which the understory is managed. Dead and dying trees will be maintained as a valuable habitat asset to wildlife where possible and appropriate. degree to which the understory is managed. Understory should be managed to slightly lower and more open conditions in the wading bird management areas, as possible, to maintain the integrity of mature trees and saplings. As with the Song Bird Management Areas, dead and dying trees will be maintained as a valuable habitat asset to wildlife where possible and appropriate. 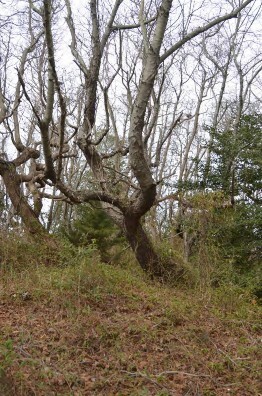 The Stone Harbor Bird Sanctuary currently suffers from extensive encroachment of both nonnative invasive vines, as well as native aggressive vines. Currently, this is one of the most significant factors that limits the ecological wellbeing, and diversity of Stone Harbor Bird Sanctuary and that of the birds that have historically nested there. Predation and disturbance are also significant factors that are not the subject of this plan but should be noted. Table I documents the dominant known invasive nonnative and aggressive species occurring in the Sanctuary. This table comprises the species targeted for management because of the significance of the impact and threat that they pose to biodiversity and habitat suitability at the Sanctuary. * both native and non-native strains occur but the non-native strain is believed to be the invasive version. The table of identified and target species for vegetation management at the Sanctuary represents a listing of known invasive species. It is likely that additional invasive plants are present in the Sanctuary and will be identified and assessed as ongoing vegetation management occurs and new areas are investigated and addressed. Knotweed, Green, Cat, and Horse Briar, aggressive native species, are also causing significant impacts to both the tree canopy and understory in the Sanctuary. Wild grapes are also a significant management challenge. They are impacting canopy cover but are a beneficial source of food and cover for nesting and foraging songbirds. Thus, management of wild grapes needs to be balanced against its habitat value. Virginia creeper also falls into this same category. Photo 1. Area of Stone Harbor Bird Sanctuary showing area of high level of invasion. The understory is dominated by invasive vines and the canopy is being stressed by vine cover. level of invasive and/native aggressive plant presence and then applies a decision matrix to recommend action areas. In some areas, it is recommended that initial vine cutting be implemented to provide relief for stressed mature trees without additional management for the time being. For the vegetation management plan at the Sanctuary to be successful, designated vegetation management project areas need to be managed for successive growing season. It is not prudent to overextend and initiate vegetation management in too many areas to allow for proper follow up and vigilance. Thus a phased approach is required and recommended. This approach will require considerable follow up management in most areas following initial invasive species removal to ensure that the area does not revert back to previous impact levels. Photo 2. Area of Stone Harbor Bird Sanctuary with moderate level of infestation with significant invasion largely confined to the understory. The tree canopy is still largely unaffected and healthy. Photo 3. 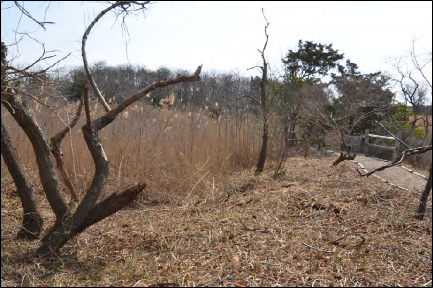 A new invasion of Japanese knotweed in an area of the Stone Harbor Bird Sanctuary. This plant is highly invasive and difficult to manage. The newly identified area should be managed quickly before it can become established. Map 5 documents the relative abundance of invasive non-native or aggressive native species in a given area. In some large areas of the Sanctuary, especially the Songbird Management Area on the eastern and southern portions of the Sanctuary, the area has been designated as having moderate levels of invasive plants, it is likely that the degree of invasive plant presence is variable in the area. The prioritization of work areas to manage invasive plants in the Sanctuary will be based on a decision matrix that accounts for a) the degree of invasion, b) current or historic use by priority species, c) the ease of access to an area, d) the ability to manage and maintain the area in a natural state, e) available resources, and f) the present condition of the area which will continue to evolve based on response to management. Map 5. Map depicting the relative levels of invasive plant occurrence in the Stone Harbor Bird Sanctuary. nonnative invasive and aggressive native vines that had covered trees, dominated the understory, and provided ready access to potential nesting and roosting area by predators. Map 6. Map showing areas where invasive and aggressive plants have been managed under this plan. The recommended strategy for managing nonnative invasive and aggressive native vines involves manual cutting of vines followed by removal, where possible, from trees. In most instances, it is better to simply cut the vines and allow them to die and naturally fall from the trees. Cuts should be made near the ground, and then again several feet up from the ground removing the section of vine. In areas of significant infestation, clearing of the understory by mechanical methods, followed by brush mowing can be effective. Mechanical removal of vines and understory will open the canopy and understory and provide much needed respite to trees and allow them to leaf out and begin to recover. Mechanical clearing alone will not eradicate non-native invasive and aggressive native vines. They will resprout and regrow in the following growing season. Following mechanical removal with chemical treatment will be required in most areas. Areas will need to be inspected throughout the growing season and in successive years with spot treatments to manage regrowth of unwanted plants. The continual management required to fully manage some infestations will be further complicated by disturbance management measures implemented to encourage colonial wading bird nesting. Specifically, access to the Holly Path will be seasonally restricted thus management will need to occur during the fall, winter and early spring (October 1 – March 1). Photo 4 shows the wading bird management areas in the vicinity of Paul’s Pond immediately following clearing of vines and invasive understory in February 2014. Photo 5 shows the area around Heron Overlook before and after work to clear invasive plants from the area in March, 2014. Photo 4. 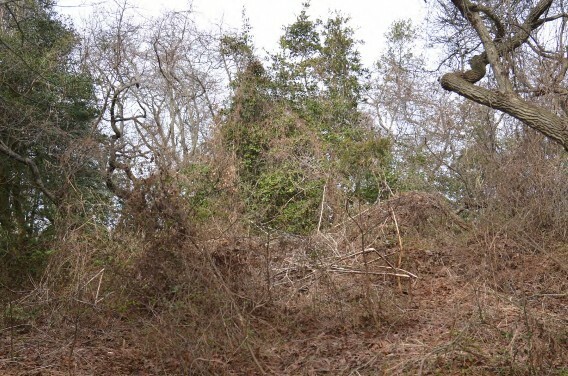 Area in the vicinity of Paul’s Pond at the terminus of Meadow Walk following removal of invasive vines form the tree canopy and clearing of invasive understory plants (October, 2013 and February, 2014). Ongoing monitoring and maintenance will document understory regrowth and determine what additional management is required. It is anticipated that understory regrowth will continue to be comprised of invasive species requiring continued management. Once the understory is effectively controlled, an evaluation of the native plants that have returned will be conducted to determine if additional native plants should be added to the area. The recommended strategy for management of the successional meadow involves vigilance for outbreaks of Japanese knotweed followed by either mechanical removal or chemical treatment of identified plants. Japanese knotweed is extremely difficult to manage so that it is critical that any new infestations be managed immediately while they are still isolated plants occurrences. Phragmites management in the successional meadow will involve chemical treatment on an annual schedule. Treatment is most effective in early fall as the plants are beginning to senesce. During this time, plants draw chemicals down into the roots resulting in more effective control. Photo 5. Top. Area around Heron Overlook Trail showing dense growth of aggressive Cat Briar shrubs, Japanese Honeysuckle vines, and Phragmites along the trail edge. Bottom. Photo immediately following clearing of vines and shrubs in March, 2014.
other freshwater plants and animals. The US Fish and Wildlife Service recommends foliar spraying for Phragmites in the early fall. This is a time when the wetland is seasonally dry limiting impact form chemical application. Chemical application should be limited to areas with moderate presence of the plant and should be used to maintain thinner density to allow for native plants to gain a foothold. chemical treatments impossible. This complicates the management of the Paul’s Pond area and limits management to the fall season after birds have departed the site. Portions of the freshwater wetland fringe suffer from Multiflora rose dominance. This area is most notably in the area at the northwest corner of the marsh. Multiflora rose management is best accomplished by cutting followed by stems and following with stem application of herbicide. It is most effective when conducted prior to the plants going to seed as birds spread roses very effectively. The primary management need in the tidal and nontidal salt marsh is the management of Phragmites. In most areas in the salt marsh, management of Phragmites is best accomplished through manipulation of water levels to cause inundation or root saturation with salt water. Hydraulic manipulation of tidal flow should be attempted before additional management strategies for Phragmites are attempted. It is extremely likely that Phragmites will never be eradicated form the Sanctuary. Rather, management should be focused on limiting its expansion and limiting it to thin cover to allow native vegetation to gain a foothold. 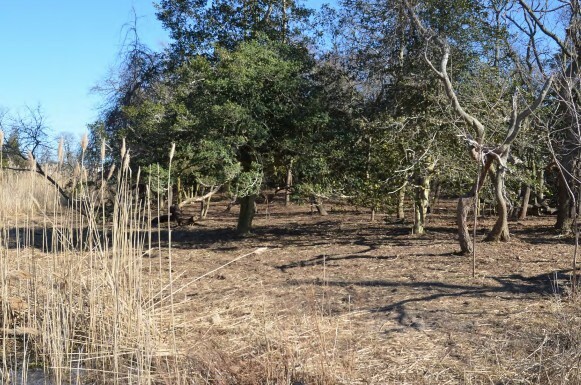 This Vegetation Management Plan will be implemented by the Borough of Stone Harbor. The Wetlands Institute will continue to work in coordination with the Borough, SHBS Committee, and state and federal partners as needed. Volunteers will be recruited from the community as an educational component to learn about invasive species occurrence and control. evaluation of the vegetation management plan, as well as disturbance management at the Sanctuary. Compatible usage is an important consideration that will also need to be addressed and incorporated into management strategies for the Sanctuary. The best way to measure management effectiveness for the Sanctuary is to measure site utilization by target species. A biological monitoring plan should be developed that identifies the suite of possible studies that would benefit the Sanctuary, as well as potential funding sources to implement species monitoring. Avian and herpetological monitoring come immediately to mind. been taken to minimize disturbance in key areas of historic and current colonial bird roosting and nesting. Educating the public about these measures, and continually managing disturbance will be critical. The Sanctuary should have a well-articulated plan for managing both human disturbance and predators. Duffield Associates, 2006. 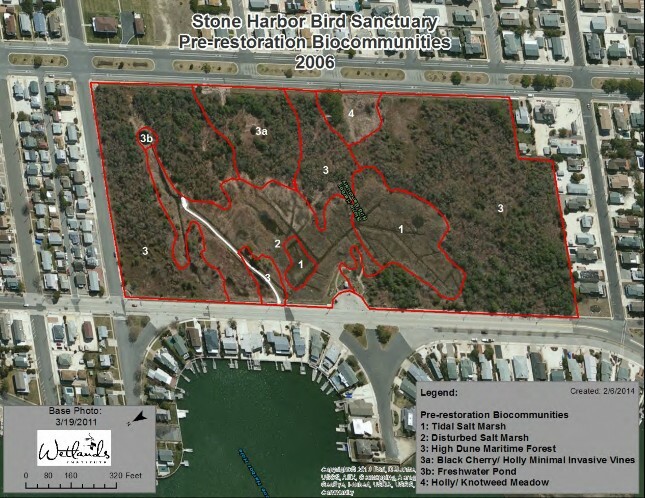 Stone Harbor Bird Sanctuary Rejuvenation Project, Preliminary Master Plan, Prepared for borough of Stone Harbor, May 2006.